The City of Angels is a massive metropolis by any comparison. With a wide array of neighborhoods home to many cultural backgrounds, it is by no means a stranger to diversity. Given the strong emphasis on its unique heritage, most of the buildings in Los Angeles are constructed with various architectural themes. Many of the more well-known buildings can be found in the heart of the sprawling metropolis, and as such are central to the city’s economic and political climate. In no small way has Hollywood had an impact on the way LA has been designed; it is the place where anyone remotely interested in acting has dreamt of living at least once. It is a fashion hub where most of the country’s film celebrities reside (or at least have one place of residence) that offers a wealth of world-famous buildings and architectural beauty. In operation since 1997, this $1.3 billion center is the central public campus of the Getty Museum, and it highly regarded for the views of Los Angeles that it offers visitors. The building itself is situated on the top of a high hill, and is accessible only by an adjoined hover train funicular that visitors must ride after parking at the base. Inside you will find a unique collection of pre-20th century European artwork and sculptures, as well as an extensive database of historic photographs from Europe, Asia and America. With a magnificent outdoor terrace (designed by Robert Irwin) that hosts numerous displays, including those created by famous artists like Vincent Van Gogh, there is no wonder why Getty Center attracts over one millions visitors a year. Perhaps not surprisingly, the sheer magnitude of this project (the building itself takes up 24 acres of land, is situated on a 110-acre plot and is surrounded by over 400 acres of vacant land), ended up costing three times as much as the initial estimate. 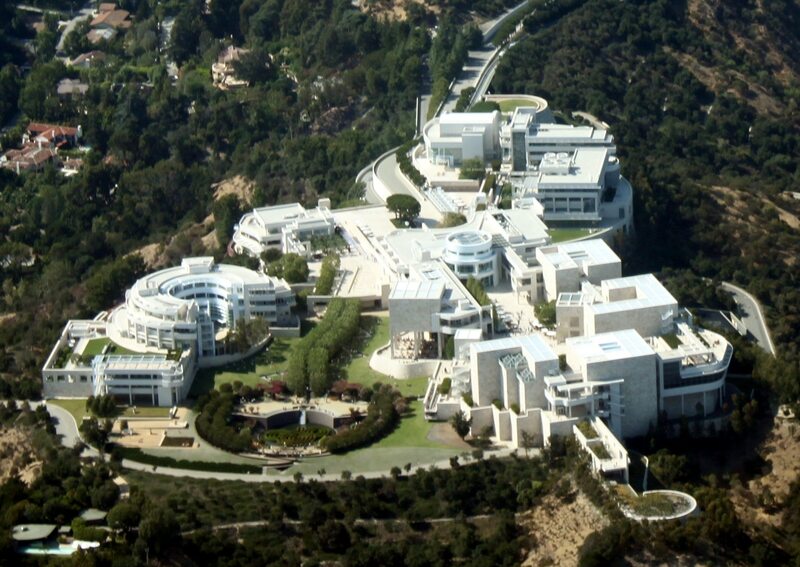 Construction of Getty Center began in 1954 with J. Paul Getty’s House and was intended to cost only $350 million, but this increased as the center expanded over the coming decades. 111 South Grand Avenue has been made famous thanks to the leading name in dreams and children’s movies. The Los Angeles Music Center’s fourth hall was designed by Frank Gehry and was opened to the public in October 2003. 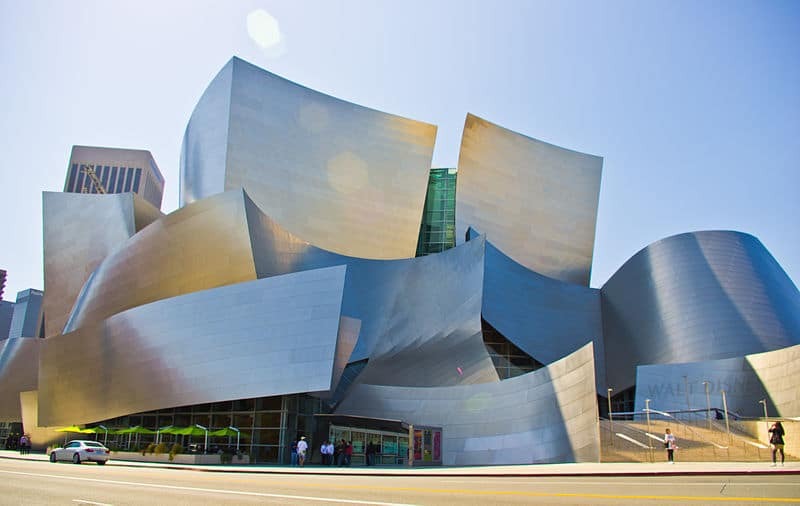 It houses seating for over 2,000 guests and is the premiere location for the LA Philharmonic orchestra, the LA. Master Chorale and many other events. The project initiated in the late 80s, after Lillian Disney donated $50 million to building a performance venue for the public. Gehry drafted the architectural design plans in 1991, and construction began in 1992 (the massive underground garage was completed first by 1994 and cost $110 million alone). If you have ever been to Los Angeles, chances are you have encountered the Theme Building. 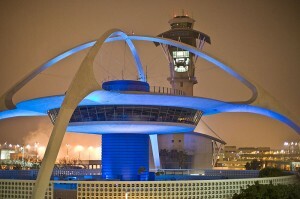 This famous landmark is situated directly near LAX and is definitely a sight worth seeing. Designed by William Pereira and Charles Luckman, the structure opened to the public in 1961. With four legs and intercrossing flying saucer rings supporting its top end, the Theme Building is perfectly at home in a city known for its creative thinking in the film industry. Given its popularity and iconic success, the LA City Council approved it as a historical and cultural monument in 1993. Since then, it has seen addition such as the Encounter Restaurant (effectively closed on 12-31-13) and a $4 million remodeling project that entailed the installation of new lighting and an upgraded interior.